Will came out of his office today around 10:30 AM to ask, "What's for lunch? I'm starving!" I guess all those conference calls can give one an appetite! I had some beautiful boneless, skinless, chicken breasts in the fridge, so I decided to get a bit creative and come up with a new recipe! This recipe was hands down, both beautiful and delicious! My objective was to use lots of fresh herbs and veggies in this meal for added nutrition, and disease prevention, without compromising taste. I remembered an old friend of ours, now deceased, had a chicken dish using leeks and white wine that was quite wonderful . . . I have leeks in my garden, so I pulled one! Parsley is one of the super foods! It is loaded with vitamins, enzymes, and minerals that help combat arthritis, heart disease and cancer . . . I brought in a handful of fresh Italian parsley too! Will wanted to use the 2 large red potatoes we had for baked potatoes, so I brought in some fresh chives! And, last but not least, I added some beautiful fresh asparagus to round out our meal! 2 tablespoons fresh squeezed lemon juice. 1 leek, the white and green stem just up to the "V" in the leaves. 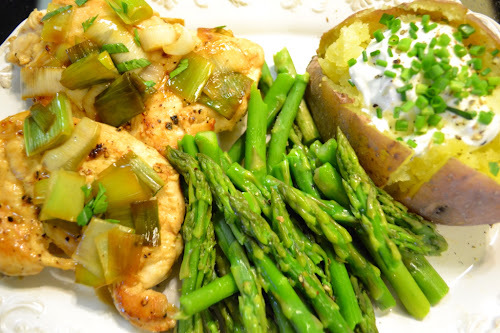 Remove all the fat and tough white tendon with a pair of kitchen scissors from chicken breasts. With a sharp knife cut through the thickest part of the breast making 2 pieces. This will keep your chicken a uniform thickness. Season breast meat with salt and pepper. To a large skillet add olive oil and butter, heat on medium high. Tip: To test if pan is hot enough, hold breast by one end and touch the tip of chicken into the oil ~ It's hot enough if the oil sizzles! Brown meat on both sides, 4-5 minutes per side. Transfer cooked breasts to a platter. 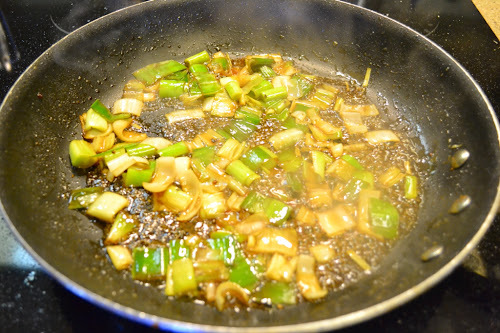 Remove skillet from heat, add Marsala wine and lemon juice. Turn heat to MEDIUM; return skillet to burner. With a bamboo spatula, scrape up all the golden fried bits from the bottom of pan. 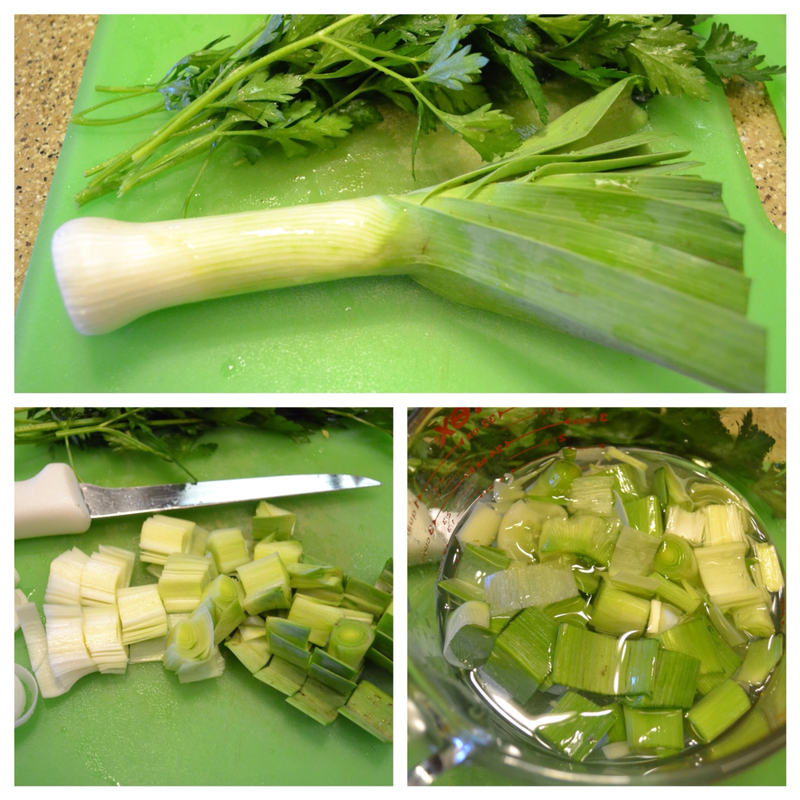 While wine sauce is reducing; trim roots from leek, slice through lengthwise. Cut leek into 1/2-inch pieces; add leek pieces to a bowl of cold water. With your fingers separate the leek pieces and swish around to dislodge any dirt from leek; wait a couple minutes for the soil to sink to the bottom of the bowl. 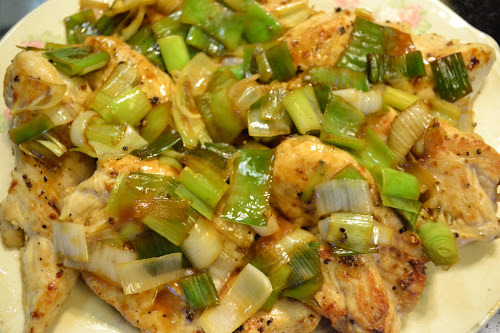 Remove leek pieces with a slotted spoon or spider, and add to Marsala sauce, cook until leeks are crisp tender and sauce is reduced by half. 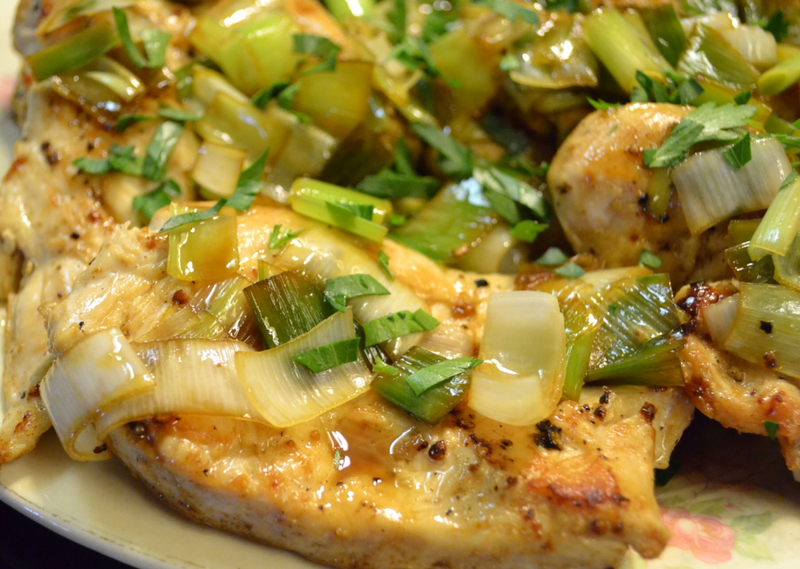 Pour sauce over chicken breasts, add chopped parsley. Serve hot with lots of veggies! Top Photo: Heating oil and butter in large skillet on Medium-High. Bottom Left: Fry breasts until well browned, 4-5 minutes per side. Top Right: Well browned chicken breasts. bottom of pan scraped up to make a rich sauce reduction! While sauce is reducing ~ Chop leek into 1/2-inch pieces, place pieces in bowl of cold water. Separate pieces to dislodge dirt and swish with fingers. Allow dirt to settle to bottom of bowl before removing leek with a slotted spoon. Marsala sauce has reduced, leek is added and cooked about 2 minutes, to slightly brown but keep crisp tender. 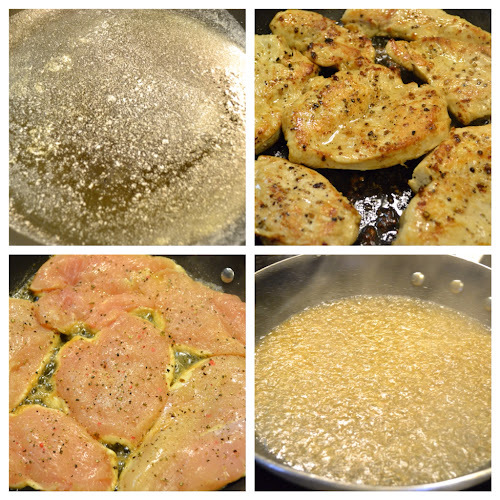 Pour sauce over beautifully, browned chicken breasts . . .
Add chopped parsley . . . and Voila!!! The secret to these moist, fork-tender, succulent, Chicken Breasts with Leek and Marsala Wine Sauce? Slice your chicken breast so it is all the same thickness. This will allow your meat to cook evenly and quickly, keeping your meat moist and tender! We are making a concerted effort to incorporate more veggies and herbs in our meals. Of course, if you grow your own vegetables, your are more likely to serve them with your meals. For years I grew parsley, rosemary and basil and never used them! I just thought it was nice to grow them. Now, I don't know what I would do without my herbs! I use them in everything! My cooking herbs are parsley, sage, rosemary, lemon thyme, and regular thyme, onion chives, garlic chives, basil, oregano, sage, marjoram, scallions and garlic and lemon grass. This year I also added chamomile, echinacea, lemon balm, peppermint, orange mint, and lemon grass, to use in teas, herbal remedies, soaps, and lotions! Chamomile, and echinacea are easy to start by seed and make a pretty addition to your garden! If you have never grown your own herbs, start with a couple of herbs you cook with frequently. For me that would be basil, oregano and thyme . . . I use these herbs in so many of my dishes! Meals will taste better with fresh herbs, you will save a bundle! If you don't have room for a garden buy a couple pots and start your own herb garden! This is a simple, inexpensive, and healthy way to make a meal your whole family will enjoy. It's elegant enough to serve when you're having company over and, you can have it ready to eat in less than 30 minutes! Now that's what I call smart . . . Over at Julies!! !